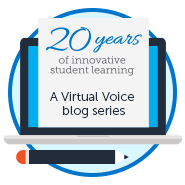 Here are a few tips for success to help parents/guardians who have chosen to explore an online home education with FLVS Flex – although many can apply to any online student! Falling into the “PJ Trap” is a danger for both adults and kids who work from home. When you don’t have to be at work or school at a set time, it can be difficult to be motivated to start your day! 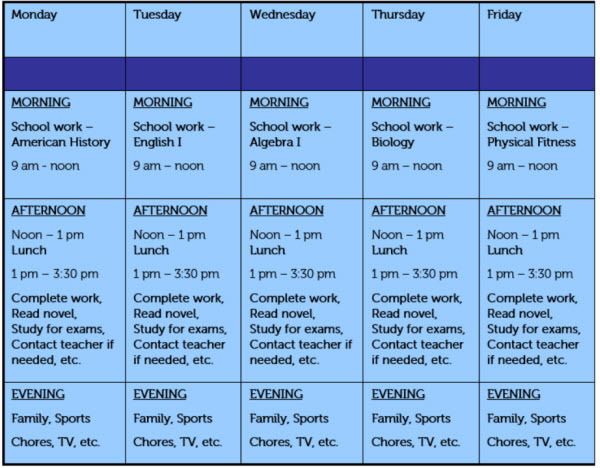 The best thing a parent can do to support his/her homeschooled child is to create a strong schedule at home and to stick to it! Consider setting alarms to cue your child to start the “school day” as well as break time times, lunch, and of course, to get them UP! Online calendars or the old-fashioned desk calendars and agendas are also helpful in keeping students organized. Take time on Sunday night to plan the week so everyone knows the priorities and goals for that week. Getting started can be daunting! Your child’s FLVS teachers are here to help! Call, text, or email from 8 a.m. to 8 p.m. Monday-Friday. Use a small notebook or the notes option in your phone to write down which teacher you spoke with and when the conversation took place. Planning and scheduling calls and DBAs can also be very helpful to avoid the ever-annoying game of phone tag! As a homeschool parent, you do not have the same school district support as you may have had if your student was in public school. Homeschool parents take full responsibility for their children’s education and this includes hunting down information on college, scholarships, career, state and national testing! Luckily, FLVS Flex has amazing counselors to help answer any of these questions. It is important to form a relationship with your student’s counselor so that you can ask these important questions! There are many other great resources out there to help you as well! One excellent example for college and career planning is www.floridashines.org. It can take some time for students to understand how to best learn online and be successful. In the beginning, it is imperative that parents stay on their students to make sure they are making progress! A great way to do this is to check the student’s gradebook every few days! The FLVS Flex gradebook gives up-to-the-minute information on assignment submissions, grades, and feedback from teachers! If your child states that he/she completed three assignments in Math today, go and check out his/her graded work and teacher feedback to see how he/she did. This will help keep your child accountable knowing that you are on top of his/her success. Home Education can be tough at times, but also so rewarding! 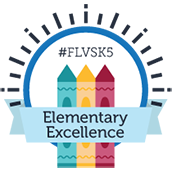 Thank you for choosing FLVS Flex for your home education curriculum! And don’t forget that tip about your counselors! If you have any questions, please contact your FLVS Flex School Counselor at 407.513.3587. This entry was posted in Homeschool Edition, Student Edition and tagged Advisement, FLVS Flex schedule, FLVS Tips, Homeschool, Homeschool Families, Homeschool parents, Homeschool Scholarships, Online Learning, Online Student, Sample Homeschool Schedule, Tips for Homeschool Parents on January 4, 2018 by Guest Blogger. Thank you for this! I’m having a terrible time keeping my chronically ill child on task and on schedule. I will definitely contact a counselor.